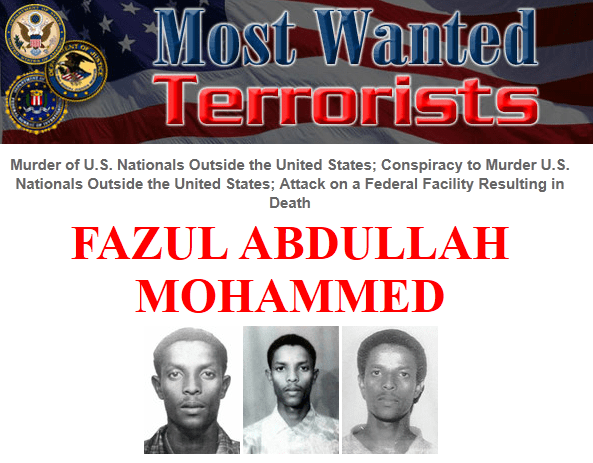 Fazul Abdullah Mohammed was indicted in the Southern District of New York, for his alleged involvement in the bombings of the United States Embassies in Dar es Salaam, Tanzania, and Nairobi, Kenya, on August 7, 1998. The Rewards For Justice Program of the Department of State has offered a reward of up to $5 million for information leading directly to the apprehension or conviction of Fazul Abdullah Mohammed. Today, BBC reports that Fazul Abdullah Mohammed was killed at a police checkpoint in Mogadishu. Mr Mohammed and a fellow militant were shot dead by Somali Transitional Federal Government forces at a checkpoint in Mogadishu, Somali security officials told AFP and Reuters. “Our forces fired on two men who refused to stop at a roadblock. They tried to defend themselves when they were surrounded by our men,” TFG commander Abdikarim Yusuf told AFP. “We took their ID documents, one of which was a foreign passport,” he said, adding that medicine, mobile phones and laptops were also found. Somali sources told AFP that Mr Mohammed was carrying some $40,000 in cash and a South African passport bearing the name “Daniel Robinson”. Later, an official at Somalia’s National Security Agency told AFP that DNA tests it had “confirmed by DNA tests carried out with our partners that it definitely was Fazul Abdullah”. Halima Aden, a senior Somali national security officer, also confirmed that Mr Mohammed was killed at a checkpoint this week, and that he had a South African passport. One source told AFP that the incident took place at about 0200 on Wednesday (2300 GMT on Tuesday) in the Afgooye corridor, a 20km-long strip of land north-west of Mogadishu. Global Post also reports Abdullah and another man reportedly refused to stop at a roadblock, and Somali forces then fired on them. Somali forces then seized from the men a fake South African passport, medicine, mobile phones and a laptop. BBC reports that the two bodies were collected by the Somali National Security Agency and given to U.S. authorities for DNA testing.